I purchased this book for my 5 year old son as he has shown little to no interest in other educational book. A wipe clean book seemed like a new approach & I was willing to try anything having spent a small fortune on many other non Usbourne titles to no avail. Within a minute of opening the Wipe Clean Lower-case Letters book, I could see a difference. He was concentrating, admiring the monster characters, counting eyes, drawing in fangs, getting the little alien dogs digging by filling in the spade shapes. From front to back this book is STUFFED with detail. Oliver was so keen to finish each page carefully to see what was on the next page. And the beauty of it, he can wipe it clean and we can start it all again tomorrow. He has really struggled to get to grips with certain letters but thus far the book has insured that we will not be getting our "b"s and "d"s in a muddle any more. I have been recommending this book to everyone as it is incredible for improving hand eye coordination, pen control, formation of letters and still maintains a level of fun. 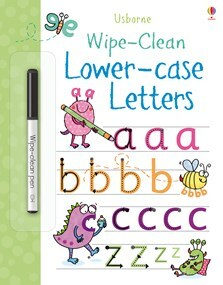 I love the wipe-clean books, Oliver and I will be saving up our pennies to buy more in the same range. Thank you Usbourne.